My name is Cammys Magic. I have been performing magic for over 10 years as a close up and stage magician performing all across the country at various events such as wedding and parties. 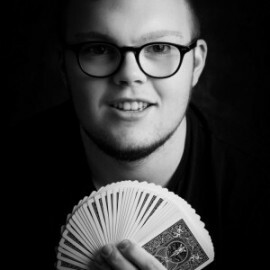 I am a close up magician great for walk around events and going around all the tables, its like a private magic show for each table which means that everyone will remember your event. I am also a stage magician with 2 shows my family show and my adult 16 plus show great for all events. My name is Cammys Magic ,I have been performing magic for over 10 years and it starts the same way as every other magician I know as I received a box of magic tricks for Christmas and that is where my story begins. Over the past 10 years I have performed at many prestigious events across the country including Edinburgh fringe, headlining Aberdour festival and many more. I currently perform magic up and down the country doing close up / table magic and I also do a lot of stage magic. I recently started uploading videos of myself online and so far I have 15 million views world wide. The sun newspaper "online sensation"
Jamie raven "one of the very best"
Stephen Mulhern "What a treat"
Patrick Monahan "hes a witch"
Matt Neil BTTC "Your a witch"
Ewan Cameron (wedding groom) "simply amazing"
Dobbies garden centre (events manger) "just magic"